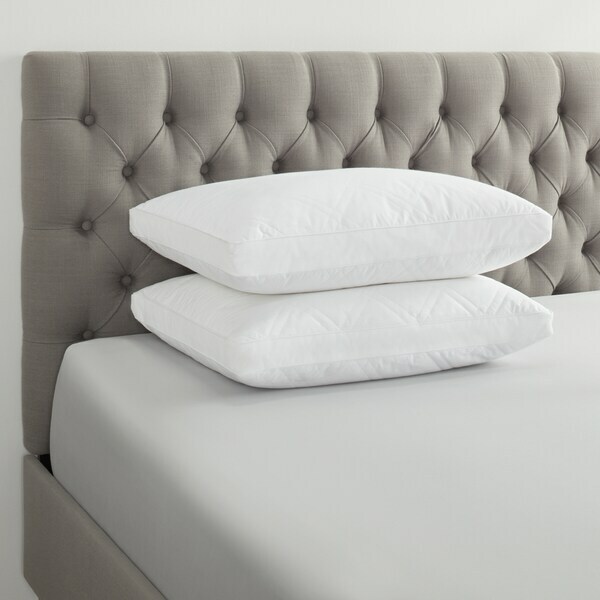 Offering a high thread count and a goose-feather fill, this pair of luxurious pillows offers both comfort and longevity. Perfect for side sleepers, these medium-firm pillows deliver the necessary softness for a good night's sleep. Featuring quilted cotton covers with gusseted edges for added durability, this two-pillow set offers long-lasting use. Down- and feather-filled products are packaged tightly during shipping. Upon receipt, remove this item from its packaging, fluff gently, and allow several hours for full loft recovery. In addition, products sealed in plastic packaging sometimes have a disagreeable scent because of concentrated natural fibers. A few hours of airing typically removes any odor. These pillows arrived half compressed inside a heavy plastic bag. There was no odor. The advice is to allow the pillows to rest for 48 hours (I think it was 48 - I misplaced the little tag) to achieve their loft and then to fluff. I did this, and they are perfect. I'm a side sleeper, and I can punch my little mountains exactly where I want in the pillow without lifting my head. No crunching sounds of feathers. I don't think they can be beat for the price. I bought a set of these pillows two years ago and have been looking for another set in the same price range for two years now. I finally found them and I sleep in heavenly peace every night. They are such high-quality and like I said, I bought a set up to two, two years ago and have never, ever had a problem with feathers coming out and they stay plump and fluffed up almost all the time. I may fluff them once a month if needed. The set of pillows I bought two years ago are still in perfect condition. I only bought another set because I wanted four pillows on my bed as I'm a side sleeper. They never shed feathers because of the piping in the stitching as well as the quilted, double stitched cover. These are absolutely fantastic! I recommend anyone looking for a feather pillow to definitely and absolutely buy these. They would also be a great housewarming gift especially to a newly married couple or a young person getting out of college and starting their life in a new home. You can't find this quality at that price of $*for a set of two in any store. There also was no odor at all and they didn't need to sit out for 48 hours to "fluff up" either, I slept on them the same night that I receive them. I am more than happy, I'm over the moon! Thank you *you're the greatest! This is the most amazing pillow I have ever found. It is the perfect medium fill. Now keep this in mind...if you like giant pillows that prop your neck up in an unnatural cervical curve, then you probably won't like this pillow. However, if you like your spine in a natural position with what feels like fluffy clouds cuddling your head while you dream of sweet comfort then you will LOVE this pillow. My boyfriend and I are so so so so happy with this purchase. My wife will not use anything other than a white goose feather pillow. This was a hit as I gave them to her. I use these every night. They are the perfect loft for me as a side sleeper. The item description is accurate. If your prefer down pillows and tend to sleep on your side, this pillow set is for you. These might be larger than your pillow cases, but worth buying some to fit these. They are not the typical fluffy down pillows. These are somewhat compact and stitched so all the feathers don't move to the ends. They're medium firm and were comfortable my first night using them. Have only had them one day but am pleased with my purchase, so far. Since this is hardly my first purchase of 'down' , was pleasantly surprised by the price and quality. Need more to refresh the quest room. Great Pillows Soft yet firm at the same time. The right amount of Goose Feathers. My Husband also gave it a 5 star best night sleep we both had in a long time. This is a pillow I will take where ever I travel because I’ve never had a pillow this comfortable. Just received these pillows last week. Even though I let them fluff for two days, they remain fairly flat and hard. The covering is thick, and whether it's that fabric or the stiff feathers inside, the pillows make a scrunching noise when you put your head on them. They are nothing like the soft, fluffy down pillows I've had from Overstock in the past, and I'll have to use them as leg pillows. Very disappointed. They flatten quickly. For me that's ok because I toss alright anyways and turn my pillow about 6X. I love that they are cool to the touch always. I am always happy with what I purchase from Overstock; but, these pillows are a real disappointment. They lose feathers rapidly and do not hold their shape. When I unwrapped them they seemed to be full and fluffy; but after two nights they reduced to nothing. My recommendation would be to spend a little more and upgrade the quality. Love these pillows! They’re a perfect mixture of firmness and being plush. They are definitely worth the cost! Great buy if you like a more medium-firm pillow. they are nice a big and soften up after a few nights sleeping which is nice.. I recommend them.. I really love these pillows. They are really soft. They arent quite fluffy enough to go under my head. Im a side sleeper amd need a high pillow or my neck and shoulder hurts. They are really nice for a side pillow. I love how they feel, very soft. I havent had a problem with feathers poking me and ive had them a month or close to it. Nice and fluffy. And the price is right! The pillows have a nice feel but they are a little less thick than I would prefer. But I like really thick pillows. Best price for super comfortable down pillows. I’ve seen the same pillows in bed bath and beyond for $ each. I’ve had multiple people ask where I got them. Nice and soft. Well made, no pillow cover needed. The pillow were amazing! They were exactly what I was looking for and super soft. The best night of sleep in a long time. "Are these pillows cooling or warning?" "Will they fit a queen size pillow case?" Yes, they will fit queen pillow cases. "I just bought these pillows and am very pleased so far. I was wondering if the slight odor dissipates over time? Anyone else notice this?" I sprayed with Lysol spray,that really helped. Mine stunk so bad I threw than out. I couldn't stand the smell in the house. Yes it does.I put mine in the dryer with a couple dryer sheets. "Is this pillow good for neck and back pain." "I order and didn't get 227 woodow Rockford ill"
"Does these Jumbo size pillows fit in standard pillow cases? What size of pillow cases do I need to get with these pillows"
Hello Rachel N., these pillows are approximately 18 inches wide x 26 inches long, they should fit a standard case. You can refer to item number 12930227 for a pillowcase that would work with this. Thanks for shopping with us!